Filed to: Could HP Be cool Again?Filed to: Could HP Be cool Again? Could HP Be cool Again? About a month ago, Intel announced its new 8th-gen CPUs, so we put together a little roundup of all the coolest notebooks getting new Core i silicon. But one company was notably left off the list, because it didn’t have anything to share at that time. 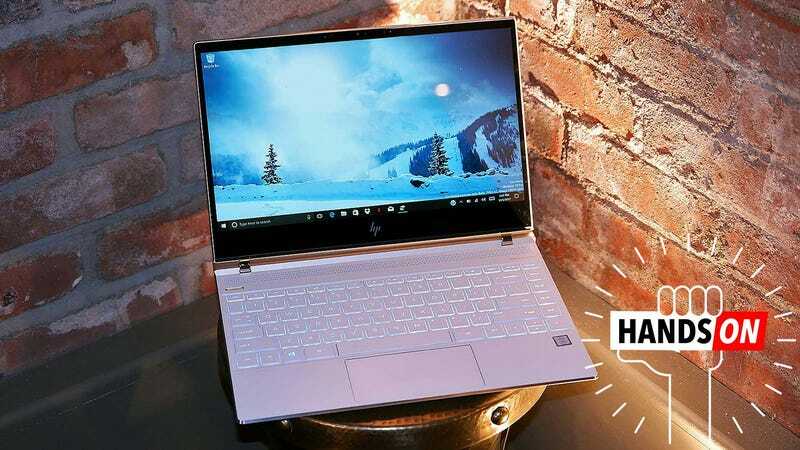 Now, HP is finally ready to show off its new Spectre and Spectre x360, and even though the saying goes beauty is in the eye of the beholder, I think its HP—not Apple, Dell or Microsoft—that’s now making the best looking laptops on the market. From almost every angle, the Spectre grabs your attention, partly because it measures just 10.4mm thick, but also thanks to its new ceramic white paint job. Paired with those pale gold accents, the Spectre doesn’t look like any other notebook out right now. And not only is that ceramic white paint pretty, the special process used to give it that look also lends it an enameled coating that HP claims increases its scratch-resistance. There’s no room for older USB Type-A ports, but three USB-C ports ensures you’ll have plenty of connectivity. The Spectre will be available in white or the same copper and charcoal color scheme it debuted last year. But especially in white, the Spectre is a real nice looking laptop. Putting the headphone jack on the back isn’t ideal, but the Spectre’s thinness didn’t leave a lot of options. The Spectre’s hinges were inspired by the kind you’d normally see on a piano. The keyboard’s backlighting is pretty bright too. The new polished sides make the copper accents stand out. A closer look at the Spectre also reveals the new model has much smaller bezels around the screen (down from 15mm to almost 5mm), slightly smaller overall dimensions (12.13 x 8.86 x 0.41-inches), and the option to upgrade to a touchscreen with 4K resolution. And unlike a lot of other super slim laptops, HP has kept the Spectre’s web cam in the right spot (above the display), while also adding in Windows Hello support—which means you can log in with your face. The Spectre’s new speakers are much louder and richer than last year’s model. On the performance side, despite the Spectre’s extra svelte profile, you still get an 8th-gen quad-core Intel Core i7 CPU that HP claims offers almost 50 percent better performance compared to last year’s model. And in back, you get three USB-C ports (two of which support Thunderbolt 3) along with a standard headphone jack. However, people looking for USB Type-A slots will have to opt for a dongle. The Spectre is so thin, those boxy old school ports don’t fit. My one concern is Spectre’s battery life, as longevity on the previous model was mediocre at best. And even though HP says the new Spectre could last up to an hour and half longer than before, I won’t be convinced until I can test it out for myself. Oh, and if you aren’t as taken with the new white and gold color scheme as I am, the Spectre will still be available in copper and charcoal (or Ash Silver if you buy into HP’s incomprehensible color naming scheme). The x360's hinge lets you transform it into tent mode, tablet mode or anything else you need. The x360 will be available in two colors: silver and copper/charcoal. That hinge is sharp as hell. Even though there isn’t a ton of key travel, the x360's keyboard still feels really good. Unlike the standard Spectre, the x360 features both types of USB ports. The silver is nice, but a little boring IMO. One of the big new features the 2017 x360 is the addition of a side-mounted fingerprint sensor. As for the new Spectre x360, changes aren’t as extreme, though HP smartly didn’t mess with its flagship 2-in-1's design. As before, it’ll come in your choice of silver or copper and black color, with new Intel 8th-gen CPUs, 1080p or 4K touchscreens and built-in stylus support; all held together by a sharper, more aggressive 360-degree hinge. New additions include a webcam with Windows Hello support, a side-mounted fingerprint sensor and for the first time on one of HP’s non-business oriented machines, an optional built-in privacy screen. The image on the left is the normal view you see when looking straight on, while the image on the right is what HP’s privacy screen looks like the further you move away from the center of the screen. Unlike the privacy screens on older HP laptops that blacked out the display when viewed from more than 35 degrees to the sides, the HP’s new technique involves boosting white backlight so that unless you’re in the screens sweet spot, all you see is white. It’s a nice cross-over from HP’s enterprise machines, and while it might be a little overkill for most, it could make keeping up with the latest memes in public a little less embarrassing. Either way, I think both of these laptops look fantastic, and in some ways, the Spectre is the MacBook Air replacement that many people have been searching for, since apparently Apple can’t be bothered. Its appears to be a traditional laptop with tiny dimensions and good design, but I’m going to have to wait for a full review to make a final judgement. Both systems will be available on October 29 with the the Spectre x360 starting at $1,150 and the super thin Spectre starting at 1,300 (the white and gold model will cost you extra since it also includes that 4K display). Do the laptops perform as good as they look? We’ll have to wait and see.